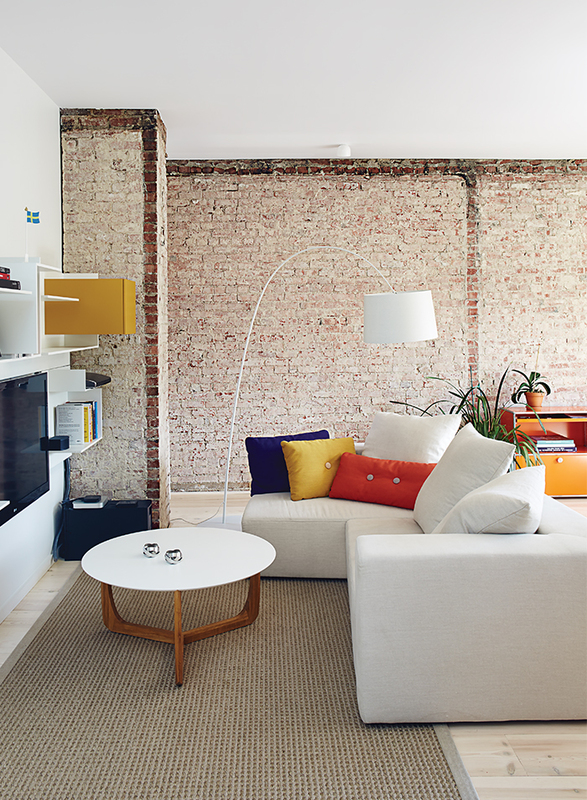 A clever design team brings a dash of Scandinavian style to a Danish executive’s flat in a renovated Montreal triplex. Emilie Bédard and Maria Rosa Di Ioia of EM Architecture gave Erik Rydingsvärd’s top-floor apartment in a Montreal triplex a subdued, modern look that evokes his native Denmark. The range hood and satin-finished teak cabinets are by Kastella. The floors are Douglas fir and the walls are spruce, painted white. The apartment originally crammed four closed rooms and a kitchen and bathroom into 1,000 square feet. After the renovation, it had only one bedroom and a large, open kitchen. The living room is furnished with a Vita modular shelving system from MDF Italia, a Lili coffee table by Add Interior, and a custom sofa by Linea P International. The Dot cushions are by Hay. This view shows how the space was previously divided. The spacious kitchen makes it ideal for entertaining. Di Ioia and Bédard designed the wrought-iron spiral staircase that leads to the rooftop terrace and sauna as a visual nod to Montreal’s signature outdoor stairways. In the master bath, a dowdy tub was replaced with a standing shower designed by Di Ioia and Bédard and manufactured by Linea P International. The wall and floor tiles are by Ceragres, and the sink, tub, and towel rack are by Aqua Mobilier de Bain. A before shot of the bathroom. The master bedroom includes an armoire by Kastella and a chandelier by Lambert & Fils. A portion of the ceiling was pared back to expose the underside of the original roof. The same space before it was updated. Atop the spiral staircase, a custom iron bench is festooned with Turkish throw pillows from SophiesBazaar. Torrified cedar lines the inside of the rooftop sauna. Rydingsvärd often cooks out on his terrace, which offers a view of Mount Royal. The volume housing the sauna is clad in cedar planks that were painted black. The door and windows are by Alumilex, and the custom outdoor shower is by Avantage Plus. So Rydingsvärd quickly sold the condo for a small profit and, in 2012, returned to the Plateau, this time spending a year in a rented house while he searched, block by block, for that quintessential triplex he’d first imagined. “I used to take my bike at night,” he says, “and check, like, Where is there no traffic at night? Because I’m a bit obsessed with being able to sleep with the windows open.” He narrowed his hunt to a pair of streets that run north-south between the Plateau and the adjacent and similarly artsy Mile-End. On one of the streets, his agent found a building perfectly suited to his vision: a circa 1910 triplex with three floor-through units. The bottom two had been renovated recently enough that they could be rented with minimum upgrades. 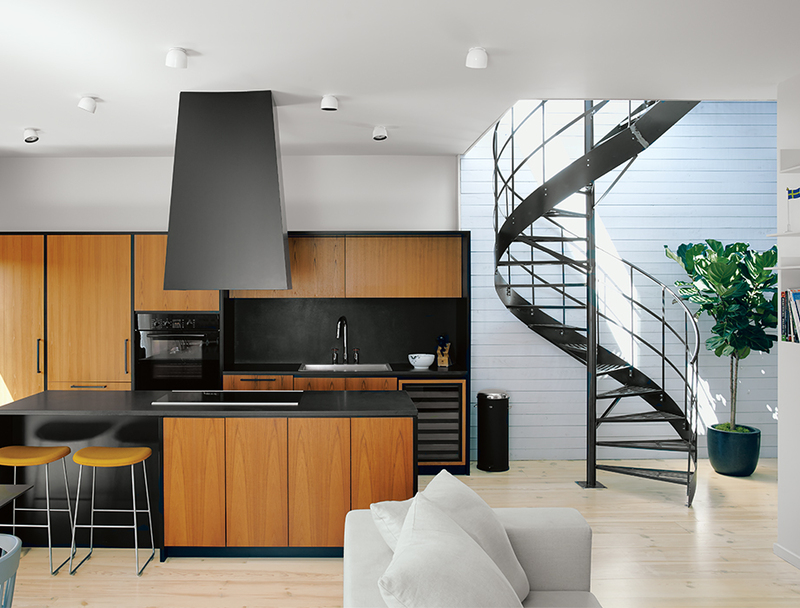 The top apartment, however, was “disgusting,” Rydingsvärd says, which made it a perfect candidate for the top-to-bottom renovation he envisioned for his own home. 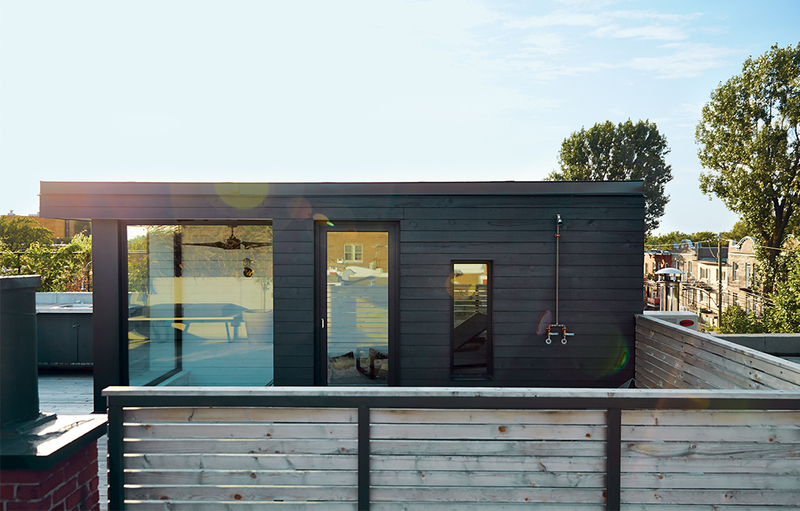 Chief among his must-haves: an open-air space to entertain and a sauna—both on the roof. “I was pretty fixed on both ideas,” he says, “because I had an apartment in Copenhagen where I had a sauna on the roof as well.” He also wanted to convert the apartment—which crammed four closed rooms and a kitchen and bathroom into 1,000 square feet—into a one-bedroom with a large, open kitchen. Outfitting a small alcove with a Murphy bed would give Rydingsvärd just enough room to accommodate houseguests. “The first thing we wanted to do was open it up completely,” Di Ioia says of Rydingsvärd’s top-story unit. “And so we toyed with, How do we open it up without having to intervene too much on the lower floors?” Emilie Bédard, the architect Rydingsvärd hired to design the space along with Di Ioia (the two have since joined forces under the name EM Architecture), decided that installing cellar-to-rooftop columns and new beams to support a terrace would be too onerous. Instead, Bédard says she decided to remove about three-quarters of the roof structure toward the back of the building and install new joists. This move, along with their decision to strip away the old ceilings at the front of the building for a loftlike effect, allowed her to augment the ceiling height throughout the apartment to just over ten feet from around nine feet, helping to create room for the staircase to the terrace and sauna. Only a small portion of the original roof—its underside beautiful and intact after the apartment’s ceilings were peeled back—was preserved, to act as a new ceiling for Rydingsvärd’s street-side bedroom. And for the long winters, there’s the sauna. Constructed inside the cupola-like stairwell, which added 100 square feet to the apartment’s footprint, the sauna is outfitted with glass paneling and oriented to capture views of Mount Royal, the hill at the center of town that gave Montreal its name.